Having a hobby is not just a way to pass the time; it can also improve the quality of your life. A hobby is something that you do for fun or pleasure. You do it during your free time, and you don’t get paid to do it. Since hobbies are leisure activities, a lot of people discard hobbies as a “luxury” they can’t afford. Who has the time, right? A hobby can give you a sense of self-efficacy. A hobby can be a creativity outlet. Having hobbies will keep your brain engaged. A hobby gives you something to look forward to. A hobby can give you something to be passionate about. 1. Say Your Oms. Everyone should take up meditation. But is meditation a hobby? I say that it is. Taking up meditation will help you to reduce stress, lower your blood pressure, strengthen your immune system, and even improve your ability to concentrate. Is meditating fun? When I meditate–which I do for ten minutes, daily–I turn on my Enya CD, light a candle, and lie down on my yoga mat. Once I’m completely relaxed I get into such a good mood, that I would say that meditating is definitely fun. It counts as exercise (and we all need to get at least 150 minutes of exercise a week). To top it all of, gardening puts you out in nature. I wrote about eight of the many benefits of being out in nature in this post: “8 Reasons Why You Need to Spend More Time in Nature“. 3. Reacquaint Yourself With Your Kitchen. Studies show that those who cook their meals at home are healthier and live longer than those who regularly eat out. Nutritionist Kimberly Snyder indicates that when people pick out their own food at the grocery store, they buy less processed foods, less sugary foods, and less fat. Instead, they make healthier food choices. In addition, cooking at home helps you to save money. 4. Pick Up a Book. Reading is a lot more than just a pleasant pastime. Reading sharpens comprehension, teaches your mind to focus, and improves your vocabulary. It also boosts your brain power: just like jogging gives your body a workout, reading gives your brain workout. 5. Tickle the Ivories. Playing an instrument, such as the piano, can increase cognitive development. In addition, it improves eye-hand coordination and fine-motor skills. And here’s the kicker: playing a musical instrument raises IQ by seven points, in both kids and adults. Kind of makes you want to run out and get yourself a keyboard, doesn’t it? 6. Dust Off the Chess Board. You probably already know that chess is a great hobby to take up if you want to improve your brain’s cognitive functions. To start off, playing chess exercises both brain hemispheres. First, players must develop and utilize the left hemisphere of the brain, which deals with object recognition. Second, they must utilize the right hemisphere which deals with pattern recognition. Chess also helps to improve memory and helps to develop strategic thinking. 7. Take Up the Mambo. Not only is dancing fun, but it also has many benefits. Of course, when you dance you’re getting a physical workout. In addition, dancing reduces stress and increases levels of serotonin, a neurotransmitter that’s linked to feelings of well-being. Another benefit of dancing is that it increases cognitive acuity, which means that it makes you smarter. 8. Find Nemo. A growing body of scientific research shows that having pets can make us healthier. That’s why more hospitals, nursing homes, and mental institutions are using animals for animal-assisted therapy. Granted it’s mostly dogs and cats, but fish are also being used. While it’s not always practical to keep dogs and cats, there’s always room for fish. In addition, fish require little time and attention. Finally, no one can argue against the calming effect of watching fish serenely gliding through the water. I’ve owned several goldfish throughout my life (all currently deceased), and I’m thinking of getting another one. 9. Get the Ball Over the Net. Joining a sports team is a great way to meet new people and make friends. Signing up to play intramural sports–volleyball is an easy team sport to learn to play decently–is a fun way to spend time with others, which is one of the keys to happiness. In fact, studies show that social isolation is deadlier than obesity. So, the next time you’re about to go home and watch TV alone, head over to the YMCA, instead, and play some volleyball with others. 10. Connect With Your Inner Karate Kid. Studying and learning a martial art–such as karate–has real value. By learning a martial art you’ll be learning self-defense skills. 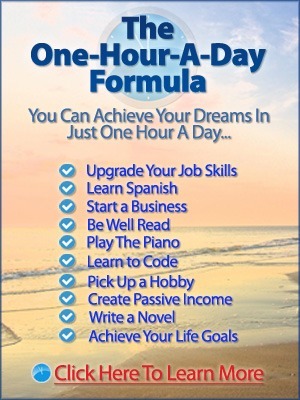 In addition, you’ll be acquiring discipline and improving your ability to focus. Also, practicing martial arts will help you to develop balance, stamina, coordination, and strength, as well as bring together your body and mind. 11. Ride the Waves. You’ve probably heard of the state of flow — when you’re so completely immersed in what you’re doing, that your ego fades away, time stands still, and you become one with what you’re doing in the present moment. Surfing is a great way to experience the state of flow. A challenging environment: there’s always unpredictability when riding a wave, so you have to remain fully focused on what you’re doing. Having clear goals: what could be more clear than the goal of riding a wave without falling off the board. Immediate feedback: you either ride a wave successfully, or you don’t. 12. Pick Up Those Knitting Needles. Experts say that crafting can help those who suffer from anxiety, depression or chronic pain. In fact, crafting has benefits similar to meditation. Occupational therapist Victoria Schindler explains that the repetitive motions of knitting, for example, activate the parasympathetic nervous system, which quiets the “fight or flight” response. 13. Put Pen to Paper. Keeping a journal can help you to organize your thoughts, plan how you’re going to achieve your goals, help you to solve problems, and serve as a stress-relief mechanism. In addition, University of Texas at Austin psychologist and researcher James Pennebaker argues that regular journaling strengthens immune cells called T-lymphocytes. Finally, journaling can help you to know yourself better. You’ll be able to uncover what makes you happy and what’s draining you of energy. With that knowledge you’ll be able to do more of what brings you joy, and distance yourself from people and situations that are not serving you well. Learning new skills increases feelings of self-efficacy, which means that your belief in your ability to produce the results that you’re after increases. Learning new skills can make you more valuable at work, which could result in a promotion. Learning new things stimulates the brain and helps to keep your mind sharp. 15. Learn a New Language. Learning a new language has the obvious benefit of allowing you to communicate with people who speak that language when you travel. Also, being bilingual or trilingual looks great on your resume. The icing on the cake is that studies have shown that the brains of bilingual people operate differently than the brains of single language speakers. Learning a new language will make you smarter, it will make you more decisive, and it will even make you better at speaking your native tongue. And here are two more benefits of learning a new language: it makes you more perceptive and it helps you to ward off dementia. 16. Engage Your Inner Clown. Try juggling. 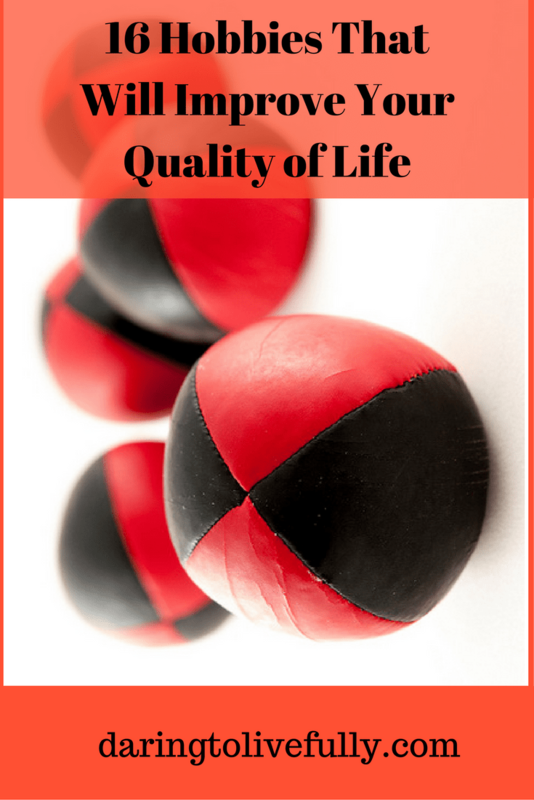 Juggling improves your focus and eye-hand coordination. In addition, it counts as active meditation: your attention is fully focused on the objects that you’re juggling, which puts you in the same beneficial relaxed state as when you’re sitting on the floor cross-legged, chanting. Also, a 2004 report from the University of Regensberg in Germany found that learning to juggle causes certain areas of your brain to grow. Unfortunately the brain will return to its original size if you stop juggling, so you need to keep it up. Take some of the time that you’re currently devoting to Facebook and to watching TV and use it to pick up a new hobby. There are an endless number of hobbies you can choose from, but you can get started with the 16 hobbies outlined above. Live your best life by starting a hobby.